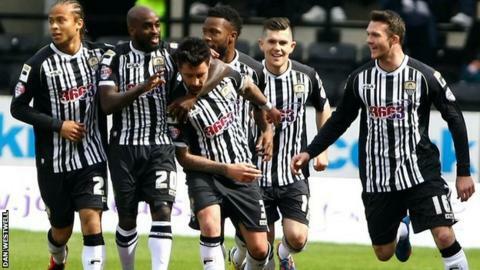 Notts County moved out of the League One relegation zone with a dramatic and crucial win over Swindon. The Magpies took an early lead when Alan Sheehan rifled in Jack Grealish's cut-back home from the edge of the box. Swindon played the closing minutes with nine men after Troy Archibald-Henville and Nathan Thompson were sent off. Callum McGregor slotted into an empty net to seal the win, with Robins goalkeeper Wes Foderingham caught upfield after an attacking free-kick. County's win moves them into 19th place, needing just a point from the last game of the season at Oldham to avoid relegation. Swindon's Thompson was dismissed for two yellow cards, while Archibald-Henville saw red for an off-the-ball incident. "It's not over yet, I've been around the game too long to know that strange things do happen on the final day. "I want us to go away on the final day and do the job right. "I've said to the lads, "let's finish the job". The boys have put us in this position - to get out of it on the final day - and I am really proud of them." "I don't think words can describe at the end what I've just seen. (I've been) watching football for 30 years and I've never seen anything like that. Disgrace to football in my opinion. "I thought he (the referee) was playing bingo, trying to get a full house with all our players being booked. "They (Notts County) were right at it today. They deserve to stay up on that performance. "I didn't think we produced enough in the final third. We never looked as if we were going to work them too much." Match ends, Notts County 2, Swindon Town 0. Second Half ends, Notts County 2, Swindon Town 0. Attempt missed. Alan Sheehan (Notts County) left footed shot from outside the box is too high. Gary Liddle (Notts County) wins a free kick in the defensive half. Corner, Notts County. Conceded by Louis Thompson. Goal! Notts County 2, Swindon Town 0. Callum McGregor (Notts County) left footed shot from the centre of the box to the centre of the goal. Assisted by Jamal Campbell-Ryce. Louis Thompson (Swindon Town) wins a free kick on the left wing. Alan Sheehan (Notts County) is shown the yellow card. Second yellow card to Nathan Thompson (Swindon Town). Troy Archibald-Henville (Swindon Town) is shown the red card for fighting. Corner, Notts County. Conceded by Troy Archibald-Henville. Nathan Tyson (Notts County) wins a free kick on the right wing. Foul by Alex Pritchard (Swindon Town). Attempt missed. Alex Pritchard (Swindon Town) right footed shot from outside the box is just a bit too high. Substitution, Notts County. Nathan Tyson replaces Jack Grealish. Attempt saved. Alex Pritchard (Swindon Town) right footed shot from outside the box is saved in the centre of the goal. Attempt missed. Alan Sheehan (Notts County) left footed shot from outside the box is close, but misses to the left. Corner, Notts County. Conceded by Wes Foderingham. James Spencer (Notts County) wins a free kick on the left wing. Substitution, Notts County. Callum McGregor replaces Ronan Murray. Attempt missed. Massimo Luongo (Swindon Town) header from the centre of the box misses to the left. Substitution, Swindon Town. Ben Gladwin replaces Lee Cox.